Found in the library. 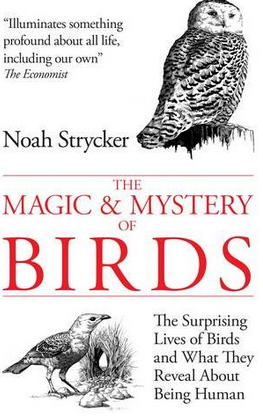 Full title: The Magic and Mystery of Birds: The Surprising Lives of Birds and What They Reveal About Being Human. Written by American Noah Strycker who seems to be something of a prodigal child in the world of birding, and last year broke a record for the most number of birds ever spotted in a single year (about 6000, I think). I was in the mood to learn something and this non-fiction book was easy to digest. It read like a collection of magazine articles (not a bad thing) on various topics, bouncing off weirdnesses in bird behaviour into discussions on human psychology, physics, love, game theory and a dozen other topics. Highlights include: a link to an amazing Youtube video of a flock of starlings in flight at sunset (look up 'murmuration' and check it out for yourself); the information that vulture poo is completely sterile (because they live off rotting meat, their stomachs have to handle any bacteria -- they can even process anthrax); albatrosses live 95% of their lives on the wing, gliding effortlessly over the world's oceans; the only species in the world who dance to music are humans, elephants and parrots. And lots of other bizarre and unexpected facts. It wasn't what I'd call a deep read, but Stryker succeeds in communicating his enthusiasm for his life's passion, and intriguing the reader too. Evie loves space. She ran in to join me on the couch and I soon realised that we were watching the 2014 series of Cosmos, hosted by Neil deGrasse Tyson. The first episode had just begun, and Evie and I watched, entranced, as Tyson led us on a tour of our local galaxies, then the observable universe. Having explored the limits of space, he then conducted us on a nifty tour of time, that compressed the history of the cosmos to a single calendar year -- on this scale, the whole of human history takes place in the last few seconds of the last day of December. It really does blow your mind... Evie was transfixed. 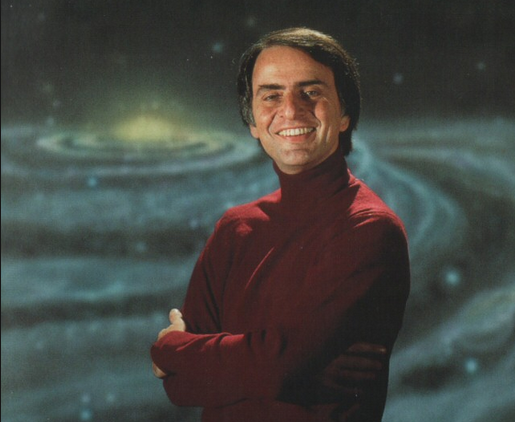 During an ad break (they are useful sometimes) I told Evie that I'd been hooked on the first iteration of Cosmos, hosted by Carl Sagan, which was produced in 1980 when I was only a couple of years older than Evie is now. And I was just as thrilled and enchanted by that version of the show, even though the effects weren't nearly as spectacular. It's the big concepts that are the real source of the magic, not the special effects. 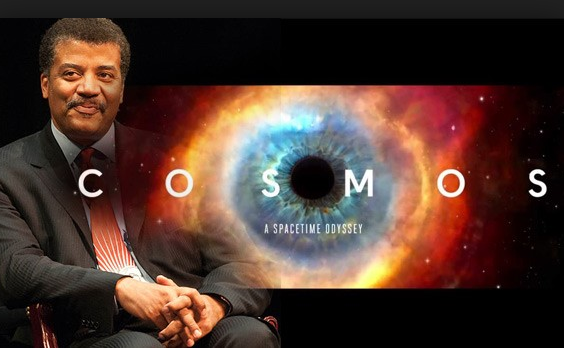 And when the show resumed after the break, Neil Tyson told a lovely story about meeting Carl Sagan in person, when he, Tyson, was a 17 year old kid from the Bronx who dreamed of becoming a scientist. Sagan made time to take him on a tour of his lab, signed a book for him, escorted him to the bus stop. It brought the show into a beautiful, human-scale circle. Evie and I can't wait for part 2. 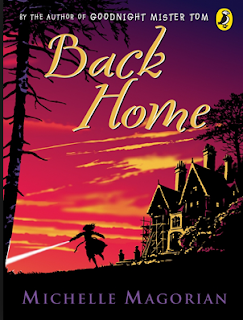 Back Home was published in 1984, and has twice been adapted for television, but I had never heard of it until someone mentioned it during the Trennels read-through of Antonia Forest's books (which I'm sure you're sick to death of me banging on about). I've been alerted to, and reminded of, lots of books via that read-through! So when I spotted this on Brotherhood Books, I nabbed it, and I'm very glad I did. Back Home deals with an aspect of WWII that I hadn't given any thought to at all. Rusty (christened Virginia) was evacuated to America at the start of the war, as a timid seven year old, but at the start of the novel, she returns to England as a far more confident and exuberant twelve-year old. Her accent, speech and manners have been thoroughly Americanised; her clothes are bright, unlike the drab, rationed clothing of the English; her voice is too loud, her opinions too decided for her reserved English family's comfort. Poor Rusty soon finds herself exiled to a strict boarding-school, where she suffers not just the torments of inadequate heating, poor food, and petty rules, but the pain of bullying and social exclusion. Although all does eventually end well, Rusty's plight is truly painful to read about. Her misery is almost unbearable at times. But it's an engaging story, vividly told. 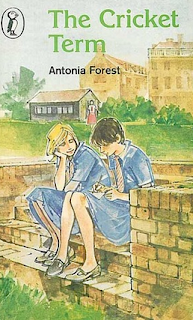 This novel brought the period of immediate post-war England strikingly to life, and provided an interesting counterpoint to the far more benign (though sometimes equally irrational) world of Kingscote, the Marlows' boarding-school, especially as the first book in the series, Autumn Term, was published in 1948. 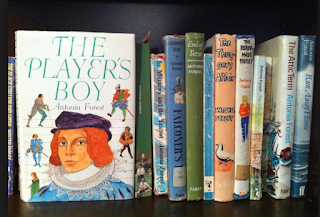 This morning I looked up the post where I wrote about my first reading of Antonia Forest's Run Away Home. I had completely forgotten that I'd written that post on 26th March last year, and seeing that date sent a peculiar shiver down my spine. Why? Because that was the last day Before; the last day when life was normal. Run Away Home was the last book I read before the day my father had a massive stroke, and all our lives turned upside down. On March 27th, 2015, my father almost died. He was in hospital for a month, and went from there straight into an aged care home. My mother moved in with us. Dad has not been back to his own home since the day he left in an ambulance. These days he gets around in a wheelchair, or, tremblingly, shuffling, with a cane. He can't use his right hand or arm at all. And since that day, he cannot speak. Our lives have changed so utterly that it's weird to look back and realise that it's only been a year and a half. We're working toward getting Dad to move in with us, too, into the granny flat that we've built for Mum. We think we'll be able to manage it (unhelpful bureaucracy notwithstanding!). And that will be another massive change. It's odd to reflect that this is one of the recurring themes that Antonia Forest's novels explore: how swiftly life can alter, from one moment to the next; how freely we toss around terms like 'tomorrow' and 'the rest of our lives', without thinking how conditional our futures are, how lucky we are when we do manage to string together our tomorrows. Still re-reading my Antonia Forest collection, and The Cricket Term is one of my favourites of the lot, and one I re-read most often when I was in high school myself. Someone elsewhere has described it as a summery, joyous book, and that is certainly true. In some ways, it seems rambling and episodic, the term punctuated by the usual small dramas (Lawrie's difficulty in finding a way to play Ariel in The Tempest, Nicola's determination to win the Cricket Cup), along with some more serious matters (Nicola finds out that due to lack of family funds, she might have to leave Kingscote; there is a wholly unexpected death). Yet the overall atmosphere of the book is happy and triumphant, with several storylines that have played out over previous books being satisfactorily brought to conclusion. The Cricket Term almost reads like the last of the series -- except that there are two more books to come, the jarringly 'with-it' The Attic Term, in which Ginty features largely (not my favourite Marlow sister! ), and the disappointing Run Away Home. Even though I've read The Cricket Term so many times before, I was forcibly struck this time by the degree to which this novel is about luck. There are many references to superstitions, rituals, and bargains with the gods. Stuff Happens, for no apparent reason, and with no apparent bearing on the overall plot: Nicola hurts her hand, but it doesn't stop her playing in the all-important final match; the person who dies has been off-screen for the whole book, and we readers have forgotten about them such as much as the characters have. Ginty relies on her lucky clover for success in the Diving Cup, but it doesn't work. Nicola's team seem to have lucky breaks in the cricket matches -- flukey catches, unlikely run-outs -- but in fact, luck is with them because Nicola has trained them relentlessly to fly for every chance. And the final awarding of the scholarship is similarly flukey and surprising, the winners and losers unexpected yet somehow right. And there is a striking contrast drawn between Nicola's hard-won stoicism, which enables her to handle her troubles and disappointments with grace and dignity, and the reactions of her arch-enemy, Games Captain Lois Sanger, whose self-deceiving, fundamentally dishonest approach to life leaves her ill-equipped to face the future that awaits her after school, as she steps out of the pages of this book and the series. It's a subtle lesson, but a valuable one. I'm considering making this pleasurable re-read an annual event -- a treat for August, perhaps, which is always such a hectic, stressful month. Something to look forward to! Remember when you were young, and you used to read your favourite books over and over? There were even books that I used to re-borrow from the library and sleep with under my pillow, not bothering to open them because I knew them so well -- I just craved the totem of their physical presence. I had read them so many times that I knew them almost by heart. But I do allow myself one indulgence, which is Antonia Forest. When I recently filled a gap in my Forest collection with Falconer's Lure, I decided to continue with a re-read of the whole Marlow series. This is a prospect of pure delight; in the last week, I've powered through Falconer's Lure, End of Term, Peter's Room, The Thuggery Affair, and I'm now in the midst of The Ready-Made Family. My Marlows experience has been immeasurably enhanced by reading the books in tandem with a Livejournal read-through from a couple of years ago, which comprises an expert chapter-by-chapter commentary, followed by a lively and thorough discussion, unpacking resonances between the books, pinpointing obscure literary references, debating time-lines and possible future developments, character consistencies and inconsistencies, and sharing favourite lines. This is my only experience of such a read-through and I don't know if it's a common phenomenon, but I can't imagine another series that would benefit so well from this kind of close attention... except, now that I come to think of it, Harry Potter! There's a scene in The Thuggery Affair where the character of Jukie declares his belief in an after-life that fits whatever the individual believes: if that's true, I'd like my heaven to be an endless supply of Antonia Forest novels, please. 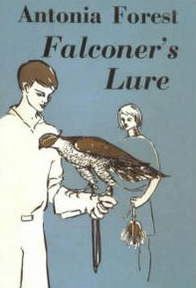 Falconer's Lure was the last missing link in my collection of Marlow books. My high school library had a copy and I could dimly remember reading it, but I hadn't got my hands on a copy for a good thirty years. I awarded myself a day off yesterday and read it straight through in a single sitting. Would it stand up to expectations? Reader, it did. Here were characters who have now become familiar, introduced for the first time (Patrick Merrick, Sprog the merlin). Here was Trennels, the Marlow ancestral home, where all the subsequent 'home' books are set. 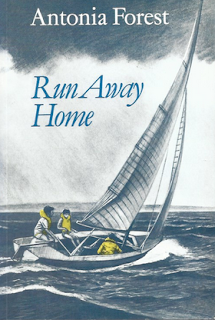 Here is a children's book which meditates on loss and grief, while being ostensibly concerned with the events of a traditional summer holiday - gymkhana, regatta, singing competition - and the less conventional activity of falconry. The sun came down in slanting lines through the trees, and made a fishnet of light on the bed of the stream. It was doing that when Nicola and Peter first met. It was still doing so, five minutes later. But by then Peter had managed to tell her that Cousin Jon had been killed when the plane crashed, and that made everything look quite different. Evie bought me this at the school's second hand book stall (I couldn't go myself due to scheduling issues, which made me sad). But it was a very good choice. 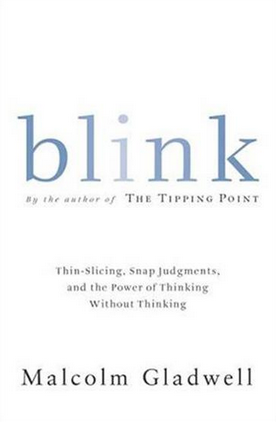 Malcolm Gladwell's Blink falls into a category I'm calling chatty non-fiction -- full of anecdotes, engaging interviews, laced together and sprinkled with enough scientific or historical or psychological theory so that it feels educational even if it's mostly entertaining. 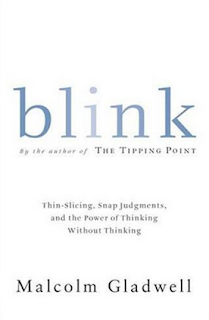 Blink is concerned with the phenomenon of snap judgments, and this fairly loose topic enables Gladwell to cover a diverse range of human experience -- falling in love, assessing the authenticity of art works, war games, the pitfalls of market research, the psychology of police shootings (this felt particularly pertinent at the moment). Did you know that after screened auditions were introduced, the number of female musicians playing in US orchestras rose by 55%? Or that there is a psychologist who can watch a three minute snippet of a married couple's conversation, and predict with more than ninety percent accuracy whether they'll still be married in fifteen years? This was a really interesting read and just what I was in the mood for. Malcolm Gladwell also has an excellent podcast called Revisionist History -- one of his first topics was the prime ministership of Julia Gillard. Well worth checking that out, too.